Owning a vehicle takes a lot of responsibility and maintenance. Often, people forget just how much their car, van, or truck does for them. Each day, it gets them from place to place, usually without fail. However, this only occurs when the vehicle is running at its optimal state. This isn’t something that everyone takes seriously, and unfortunately, taking it for granted can come with serious consequences. One of the easiest things drivers can do for their car is an oil change at AutoWorks in Delray Beach. Not only will it keep the vehicle in good working order, but it will also ensure that the car keeps more of its value and more of its longevity. The number one reason to have the motor oil changed in your car is to regulate the temperature of the engine. Fresh oil helps to decrease heat that is caused by friction. Did you know that fresh oil even absorbs heat? This is essential to ensure that the vehicle doesn’t overheat while you’re driving it. When the oil isn’t new, it can begin to collect what experts call, sludge. Let the pros at AutoWorks keep your car from overheating with a regular oil change. When the oil has sludge, it means it has a fair amount of dust, dirt, and shavings of metal. This gross collection of components can drastically impact the condition of your vehicle. Instead of a smooth ride, the dirty oil gets caught within the moving elements of the engine. Then, the engine works far harder than it needs to in order to make your car move with ease. This causes strain on your engine, and overall it deteriorates the longevity of your vehicle significantly. You can avoid this by changing your oil quarterly, or every 3,000 miles with AutoWorks in Delray Beach. All reputable repair shops will remove the old and dirty oil filter and replace it with a new one as part of the oil change service. The oil filter helps to remove some of those dirt particles from the oil so that the engine can run smoothly until your next change. The debris won’t pass through the filter, and there will be less of a chance of overheating or damage. At AutoWorks, you can trust us to remove and replace the dirty oil and the dirty oil filter – competently and efficiently. Basically, motor oil helps the engine run smoothly. Some people think that an engine is one machine, but the reality is that it is made up of hundreds of smaller moving parts and components. When those smaller parts and components move and rotate, the oil helps them do so with ease. Therefore, when the oil isn’t new, clean, and fresh, those moving parts grind together and cause distress. AutoWorks in Delray Beach can help you avoid those pitfalls. Although having an oil change seems like an afterthought, the unfortunate reality is that you will pay more if you ignore your car’s regular oil change. At AutoWorks, we have had to replace engines because drivers didn’t take their vehicle’s “health” seriously. 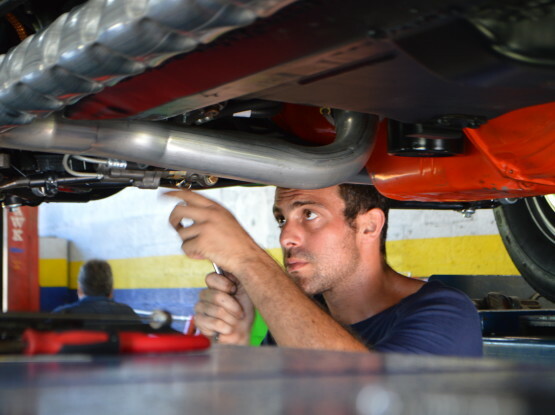 If you’re in need of an oil change in Delray Beach, we’re the team to assist. Call our motor vehicle experts at AutoWorks today at 561-272-7451.